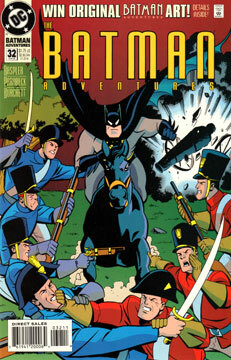 Batman finds a group of eight men dead in the street, each one dressed in 19th-century military garb and shot by muskets. After running the evidence by Alfred, he visits one of the few gunpowder manufacturers in Gotham whose product matches that used in the crime. He learns the 88-year-old owner, Hezechiah Hood, Jr., just inherited his father’s fortune. (106!) Moments later, two small “armies” dressed in period gear start fighting in the street outside. Batman recognizes one of the soldiers as a small time crook. Next Batman investigates a horse stable, only to learn of another elderly rich Gothamite that inherited his father’s fortune. (Rupert Fletcher IV was 87, his father 105!) Batman contacts Commissioner Gordon, and they work out their theory of two old, spoiled rivals who are now playing out their fantasies of toy soldiers on a much bigger scale. Meanwhile, conflict stirs anew between the two “armies.” Batman arrives, and with a well-placed detour of a cannon, he brings down a water tower, negating any and all black powder weapons. The armies and heirs are rounded up and taken to jail. Hood and Fletcher spend the rest of their days in a cell together. This was a fun issue. It was fun to see Batman acting as a detective and piecing together the puzzle. Given the historical costumes, I expected the Mad Hatter to be behind it all, but two rival heirs is far cleverer. Mike Parobeck and Rick Burchett are back together again. I can’t say this is their best work, but it’s still fine to look at. Not really, unless you want some Napoleonic-era soldiers on your shelf.